The Urban Affairs Association (UAA), the international professional association for urban scholars, researchers and public service professionals, convened its 48th Annual Conference in Toronto, Ontario, April 4-7, 2018. More than 1,000 participants, representing universities, research institutions, non-profit organizations, and public and private organizations/institutions from around the world met to discuss 21st century issues impacting urban populations and places. Conference participants represented institutions from North America, South America, Europe, Asia, and Africa. The University of Toronto, York University, and Ryerson University served as the local sponsors for the event. During the conference, awards were presented in recognition of outstanding scholarship and service. Among those honored was Gregory Squires (George Washington University). 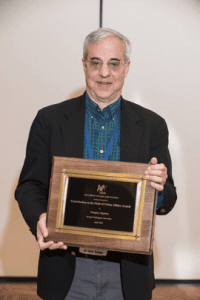 Squires was awarded the fourth ever Contribution to the Field of Urban Affairs Award, which is given to individuals whose body of work has contributed to defining the field. The Ad Hoc Committee on Recognitions has selected Gregory Squires for the 2018 Contribution to the Field of Urban Affairs Award. The committee chose Squires based on the influence of his prodigious scholarship examining urban housing markets, and for the breadth of his engagement with the UAA and other national organizations that advance our field. Squires is a prolific scholar who has published 17 books as author or editor, along with 100 journal articles and book chapters. His work is frequently reprinted in collections, offering evidence of his influence on colleagues who assemble such collections. Well beyond scholarly circles, Squires has helped to shape public policy debates about discriminatory lending, redlining, and the near-collapse of the mortgage market in 2008. As an expert witness, a legal consultant, and a working member of commissions and councils, he has called attention to unequal and discriminatory practices and identified policies that advance social justice. Beyond his scholarship and policy work, the committee recognizes Squires’ investment of intellect and energy to advance the field as a whole. Squires has served the UAA’s Journal of Urban Affairs editorial board and governing board (which he chaired in 2012). He has served other national associations and editorial boards as well, including City & Community, Shelter force, and Social Problems. He has contributed to important scholarly dialogue by publishing dozens upon dozens of book reviews. Gregory D. Squires is a Professor of Sociology, and Public Policy & Public Administration at George Washington University. Currently he is a member of the Advisory Board of the John Marshall Law School Fair Housing Legal Support Center in Chicago, Illinois, the Fair Housing Task Force of the Leadership Conference on Civil and Human Rights, and the Social Science Advisory Board of the Poverty & Race Research Action Council in Washington, D.C. He has served as a consultant for civil rights organizations around the country and as a member of the Federal Reserve Board’s Consumer Advisory Council. He has written for several academic journals and general interest publications including The Journal of Urban Affairs, Housing Policy Debate, Urban Studies, Social Science Quarterly, Social Problems, New York Times, and the Washington Post. His recent books include, Meltdown: The Financial Crisis, Consumer Protection, and the Road Forward (with Larry Kirsch – Praeger 2017) and his edited book The Fight for Fair Housing Causes, Consequences and Future Implications of the 1968 Federal Fair Housing Act (Routledge 2018). The Urban Affairs Association (UAA) is the international professional organization for urban scholars, researchers, and public service providers. UAA is dedicated to creating interdisciplinary spaces for engaging in intellectual and practical discussions about urban life. Through theoretical, empirical, and action-oriented research, the UAA fosters diverse activities to understand and shape a more just and equitable urban world. UAA sponsors the Journal of Urban Affairs, a refereed annual journal, publishing manuscripts related to urban research and policy analysis of interest to both scholars and practitioners. UAA also sponsors Upsilon Sigma – The Urban Studies Honor Society, an international, multidisciplinary honor society dedicated to recognizing and encouraging excellence in scholarship, leadership, and engagement in urban studies and related fields. The Urban Affairs Association hosts a conference each spring in an urban center. The conference program features both topics of institutional concern and those related to urban issues.